Hi ladies! This post is a little late but earlier this week was the 25th anniversary of the release of Super Mario Bros in Japan. I would have done these nails sooner but I didn't get time unfortunately. The boy absolutely looooooves Super Mario Bros and he converted me when we first started dating many moons ago! 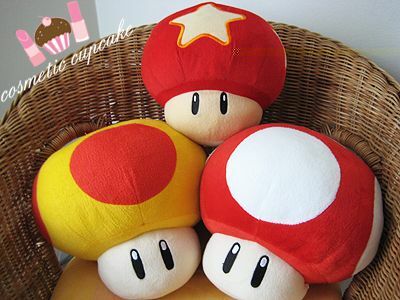 I love the characters in Mario Bros but I especially love the mushrooms. 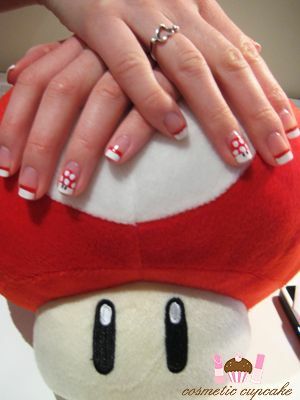 I have 3 mushroom plushies and these were the inspiration for todays manicure to celebrate. 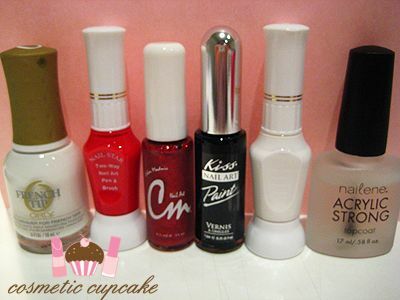 I used the tutorials by the talented CutePolish and Nikki from Askmewhats version as a guide. They looked simple enough but my lack of polishing lately has seen my skills slip! I used Orly French Tip to freehand white tips. I then used the striping brush from Nail Star Two way nail art pen & brush in red to draw a thin line just below the white tip, then I topped the red line with CM Nail Art striping polish in red glitter on all fingers except for accent finger and thumb. On my thumbs and accent finger I used the pen from Nail Star Two way nail art pen & brush in red to draw a half oval shape and drew 5 dots using Nail Star Two way nail art pen & brush in white. I then used Kiss Nail Artist Paint & Stencil Kit in black to draw eyes and topped it all off with a coat of Nailene Acrylic Strong topcoat for a glossy finish! Awwwwwwwww how cute! :) I really love Super Mario, I played it as a kid all the time. 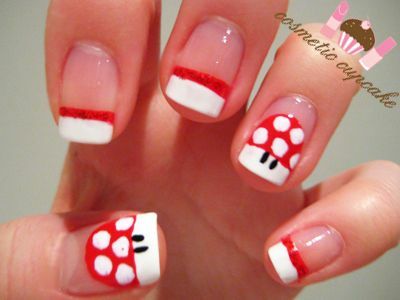 x) And Mushrooms are super cute! Uwaaaa, that's such a cute manicure. I didn't even know it was the 25 year anniversary. My darling is a huge Mario fan too, hehehe. So cute! I love Mario! those are awesome fun looking! Love the nails. So cute!!! Oh my gosh, so cute! I love this! This is so cute and creative!!! Wow, this is super cute! You are so creative! I love the mushroom!! Cute! There have been several nail enthusiasts that painted this design as well. :) I have to try it soon! Thank you for all your lovely comments ladies! I'm glad you liked the mani as I had LOADS of fun doing it!